Forget Citizen Kane… Here’s Circus Kane! May I take this space to call for an official moratorium on the killer clown flick? 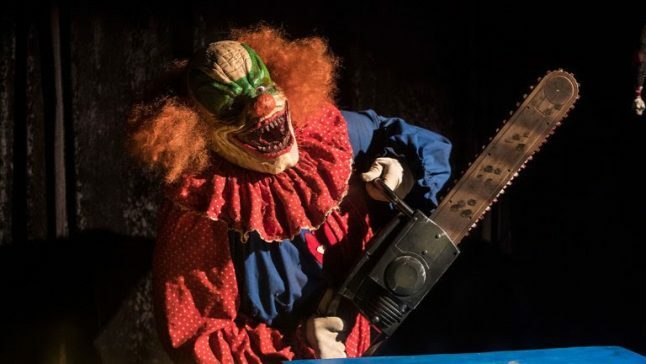 After enduring Rob Zombie’s tired and shrill home movie 31 (read our review here), the writer doesn’t care if he ever sees another damned movie about a sinister circus stalker ever again. Well, except for the new adaptation of Stephen King’s IT. Because that’s King. Circus Kane is coming from later this year from Uncork’d Entertainment and stars Jonathan Lipnicki and it’s directed by Christopher Douglas-Olen Ray (son of the great Fred Olen Ray, so there is some solid trash pedigree right there). Circus Kane sees a reclusive circus master invite a group of social media stars to his house of haunts. Anyone who can make it out before being scared into submission will earn $250,000 — but the social media stars soon learn they are not only competing for money, but also fighting for their lives. Bill Voorhees and Mark Christopher Lawrence also star. James Cullen Bressack and Zack Ward wrote Circus Kane, based on a story by Sean Sellars. Producing are DeInstitutionalized’s Gerald Webb and Christopher Douglas-Olen Ray along with Bressack.